San Diego is one of the only places in the country where you can reliably find warm, sunny weather and beautiful beaches all year. While family attractions such as the San Diego Zoo, Legoland and SeaWorld draw their share of visitors, we all know the real reason to linger is the Pacific Ocean. Entire days can be spent just staring out at the sea—watching it change throughout the day and anticipating the glorious sunset. 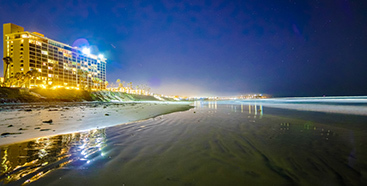 A San Diego beachfront hotel with seaside, spacious, modern 1- 2-, and 3-bedroom condominium suites overlooking sandy beaches and the famous boardwalk. Each room has a full kitchen, as well as double-sliding glass doors and a private Juliette balcony that faces the ocean. Stunning rooftop terrace sunsets. For the guaranteed lowest rates on vacation rentals, book direct! Wake up each morning to the sound of seabirds and gentle waves.